Before the clock strikes 12, allow me to wish you a very Happy New Year; and may you get all possible success in all imaginable areas in the year 2015 and beyond. I wish you to achieve all your goals. And, when the New Year arrives, my best wish is that it brings many new creative ideas to make our lives better. 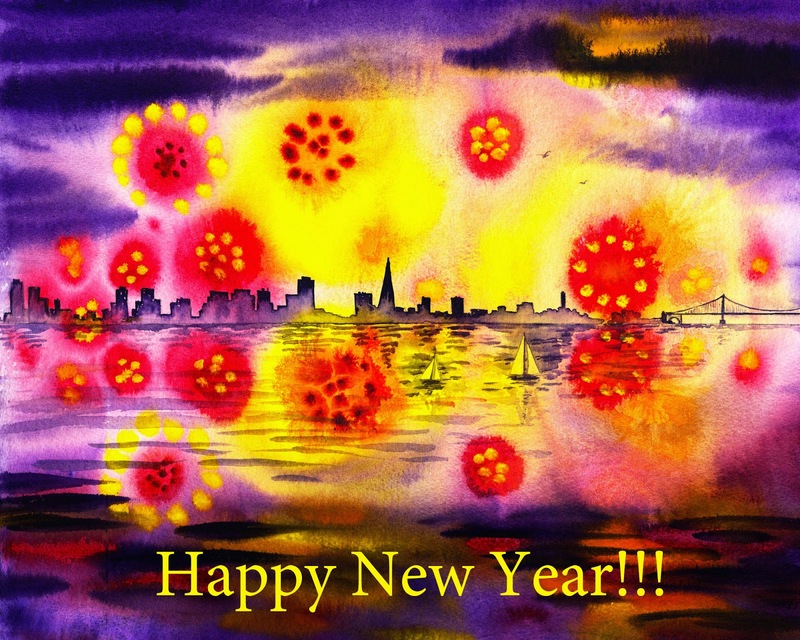 In this watercolor painting I've combined an abstract floral fireworks and the silhouette of the city over San Francisco Bay. To All A Good Time!! 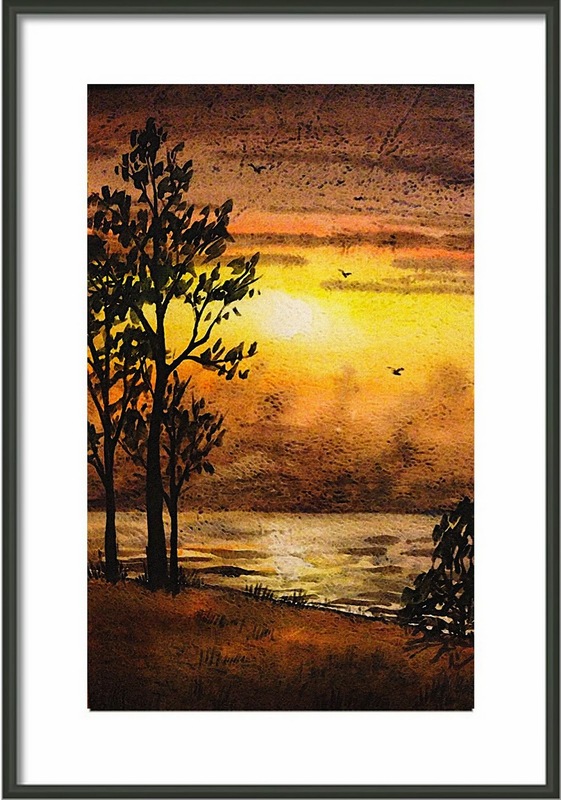 Today, I would like to share oh-so-old and not so old sunset paintings. 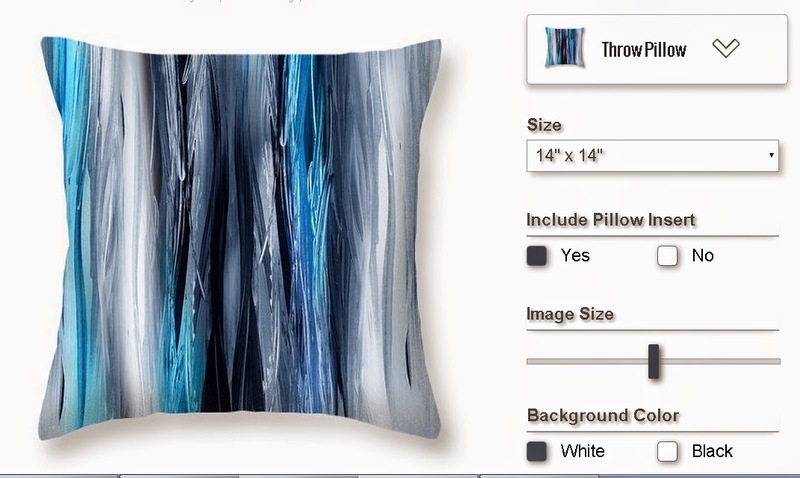 Here, I am presenting a few recent abstract works that I have painted on watercolor canvas. 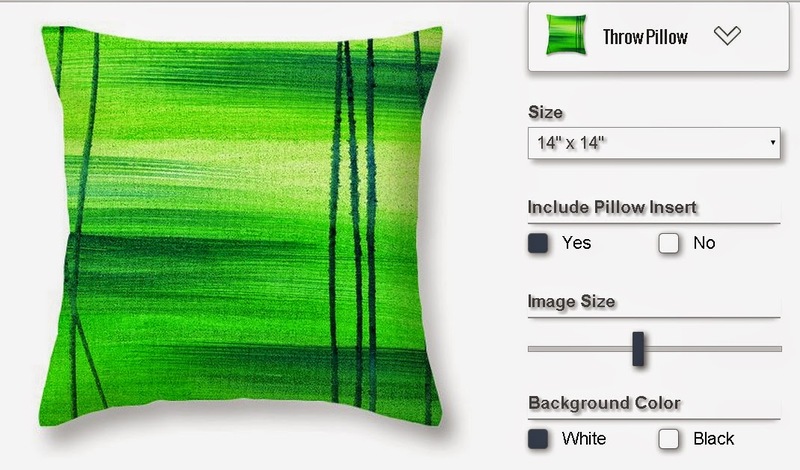 The green soothing colors reminded me a glow of emerald crystal, sometimes deep green with a blue tint and sometimes grassy yellow.. 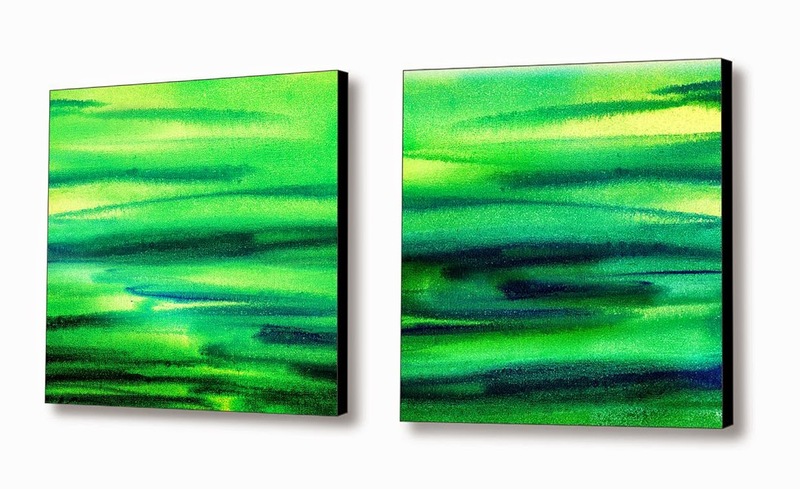 I called this part of my abstract landscape series an Emerald Flow. 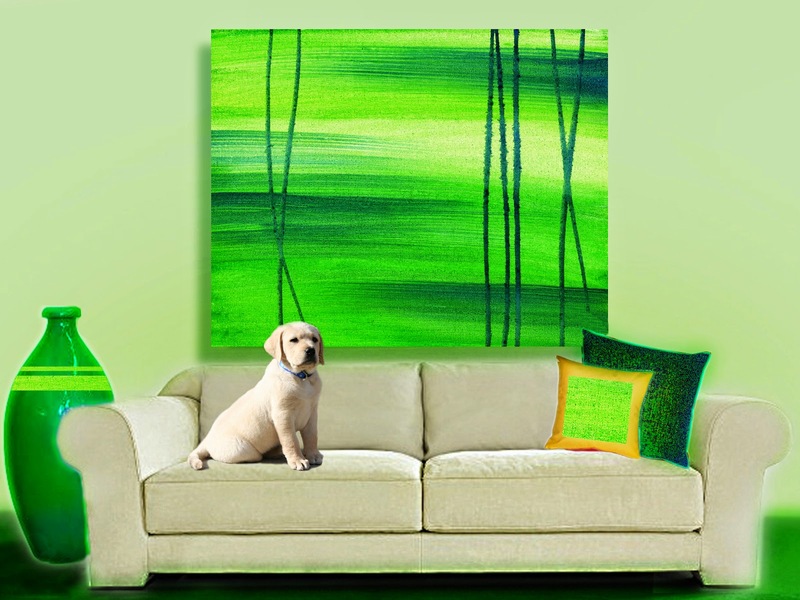 The model on a couch is Fred, my puppy, he was posing so good that I couldn't resist and placed him "to guard" the peace in this green room. 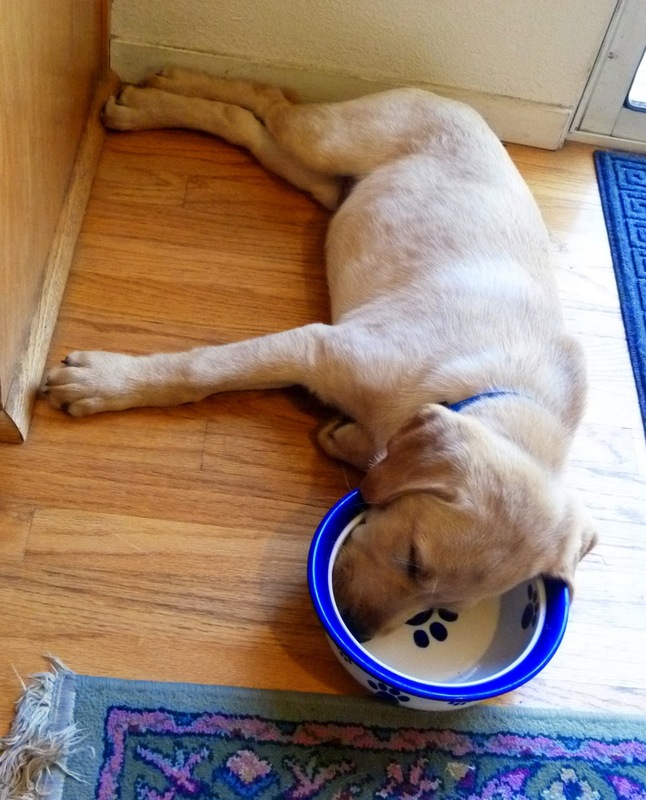 And to be fair to my other dog, here is what he was doing while Fred was "guarding".. 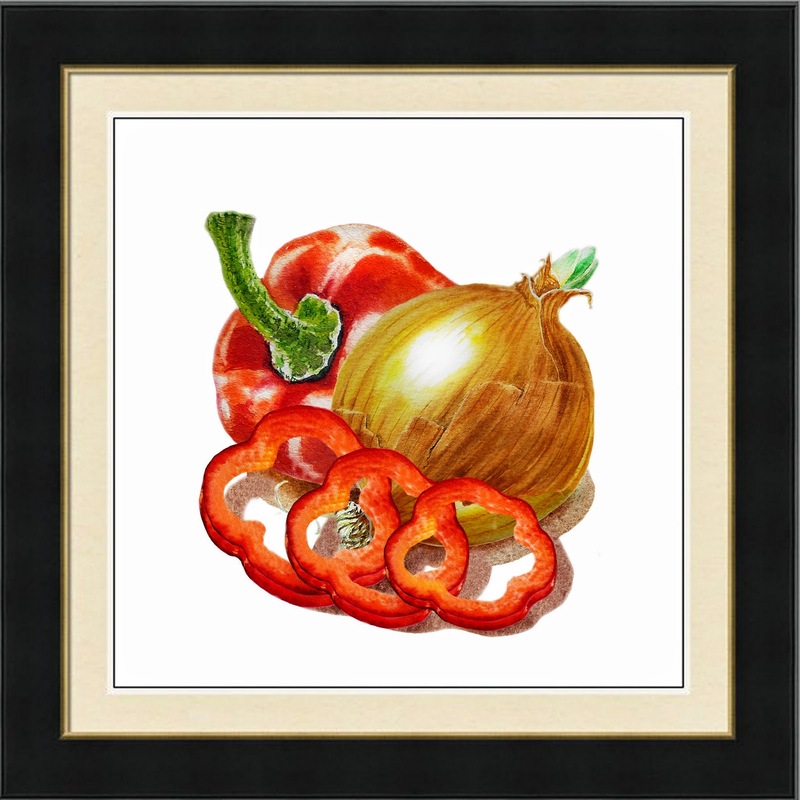 I was lucky to paint these vegetables as a part of my Jam Relish and Marmalade labels project. 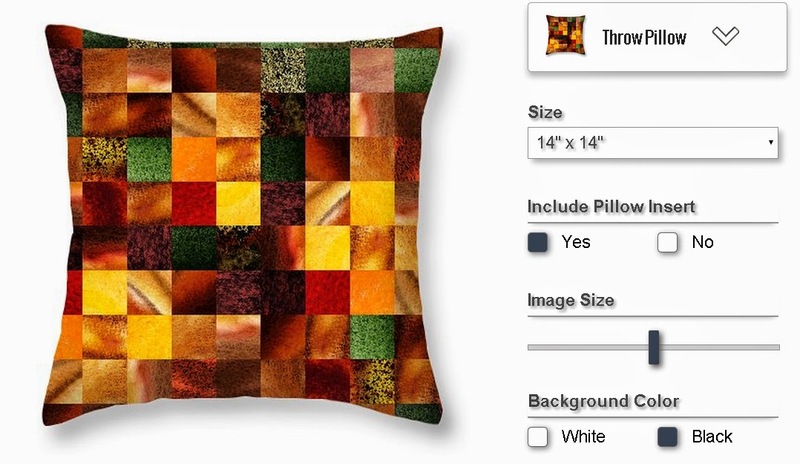 Lucky, because it made me feel quite warm in a chilly November days. 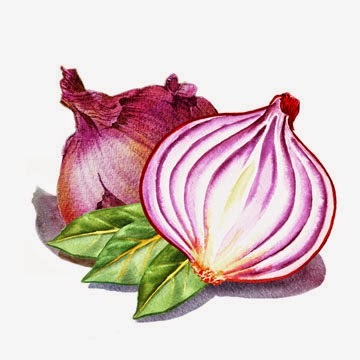 Great combinations were selected for the relishes project. 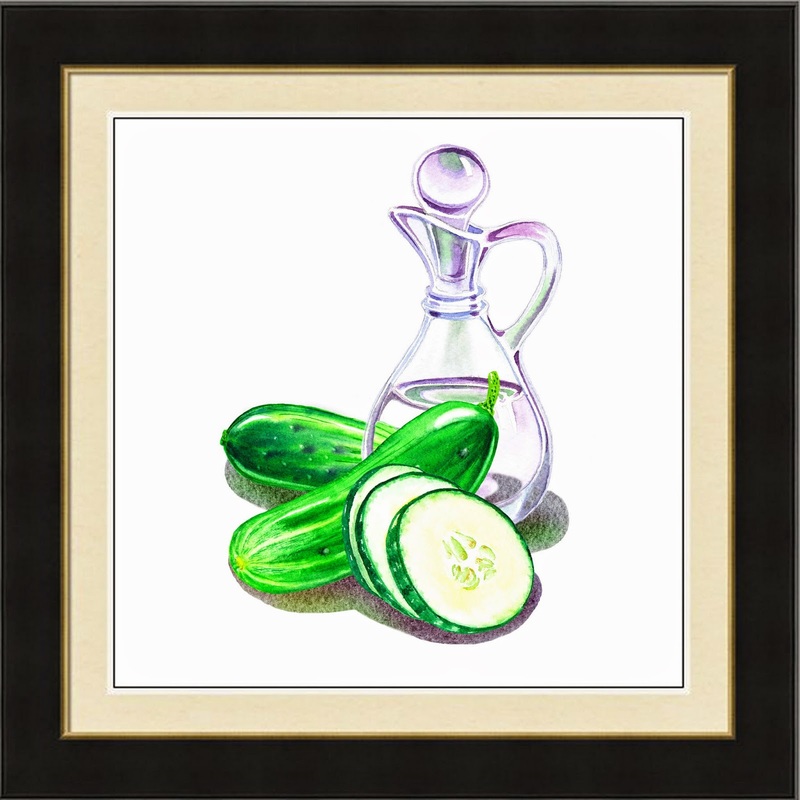 I am glad that in this relish labels project I had an opportunity to paint not only vegetables themselves, but as well a porcelain and a glass bottle. 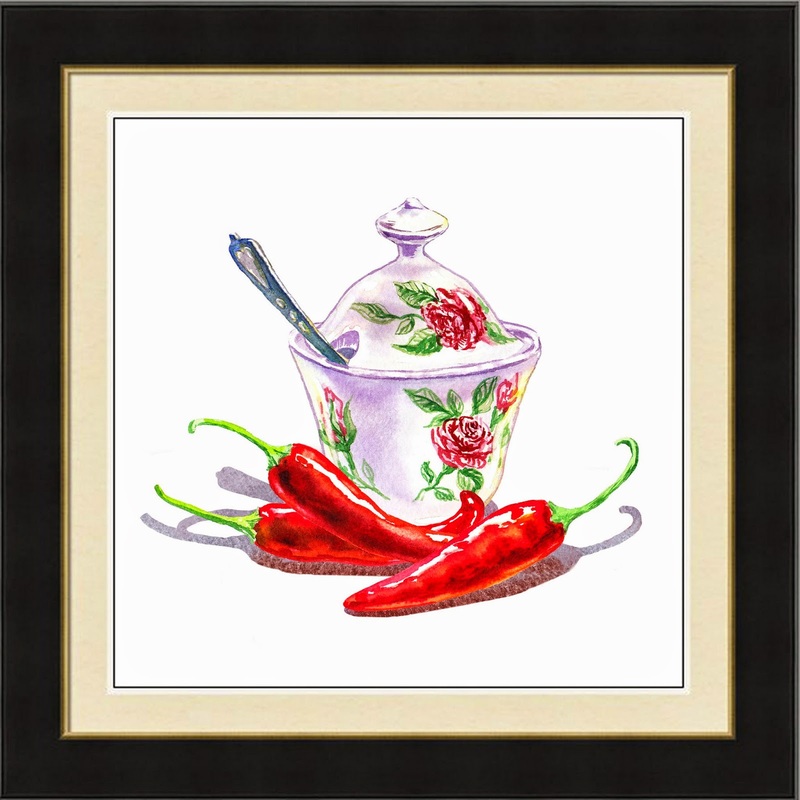 I am sure it adds some more realistic feeling to the artwork, inviting the viewer to a kitchen to try these sweet, spicy, with a dash of salt relishes. 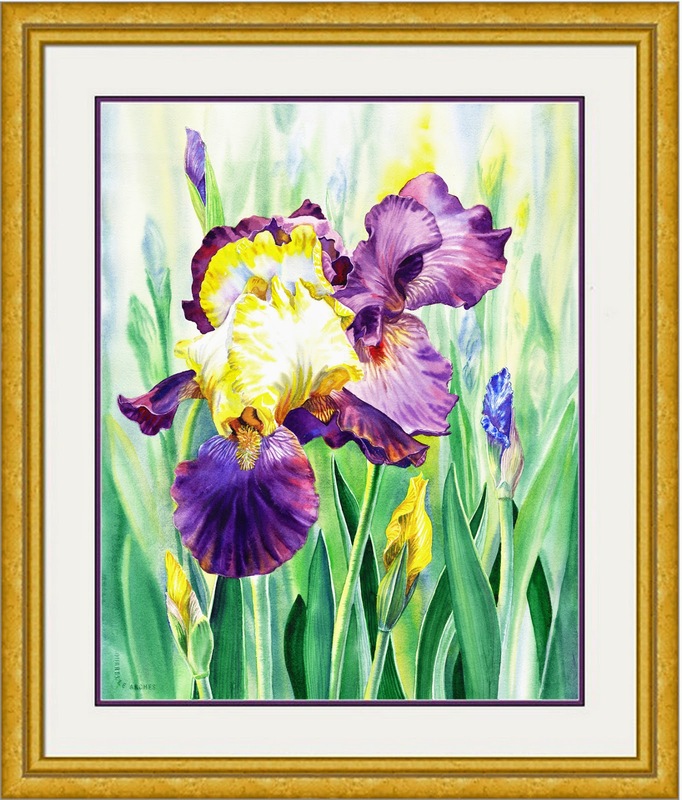 This 16"'x20" Iris Flowers painting was a pure joy to create. I received commission request from a client to paint this garden from multiple photographs. Her husband grows gorgeous iris flowers of many kinds in his garden. My client wanted to place some of them into one painting. I have used wet-on-wet technique for the background wash, yet leaving the leaves of the iris flowers untouched. 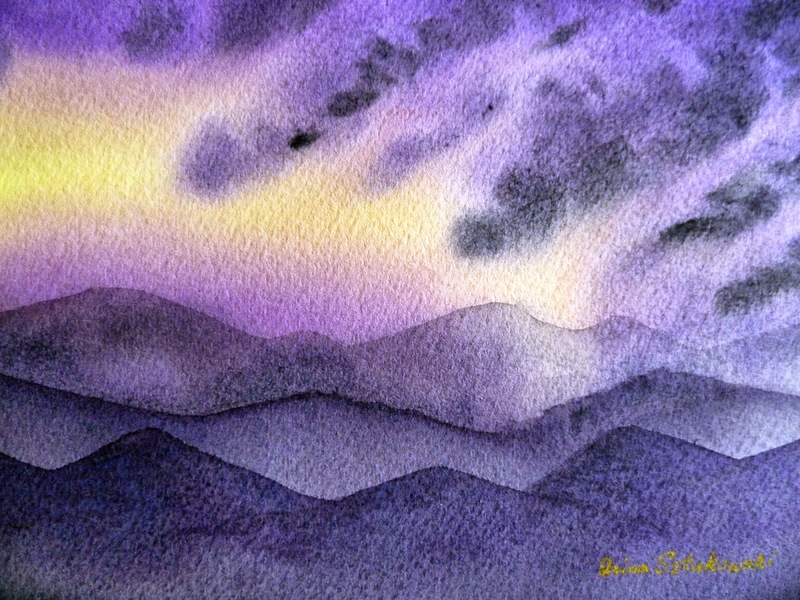 Later I painted them, one at the time, to give them more definition. Painting flowers was truly fun. 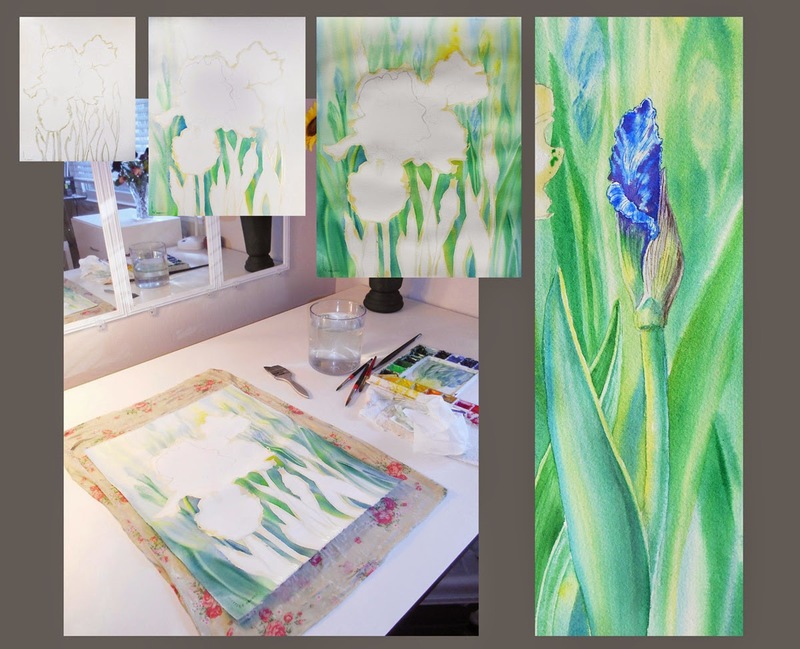 I had to incorporate the photo-references of blue iris, purple iris, and yellow iris flowers into one little garden that fits 16"x20" window of the Arches Cold pressed watercolor paper. 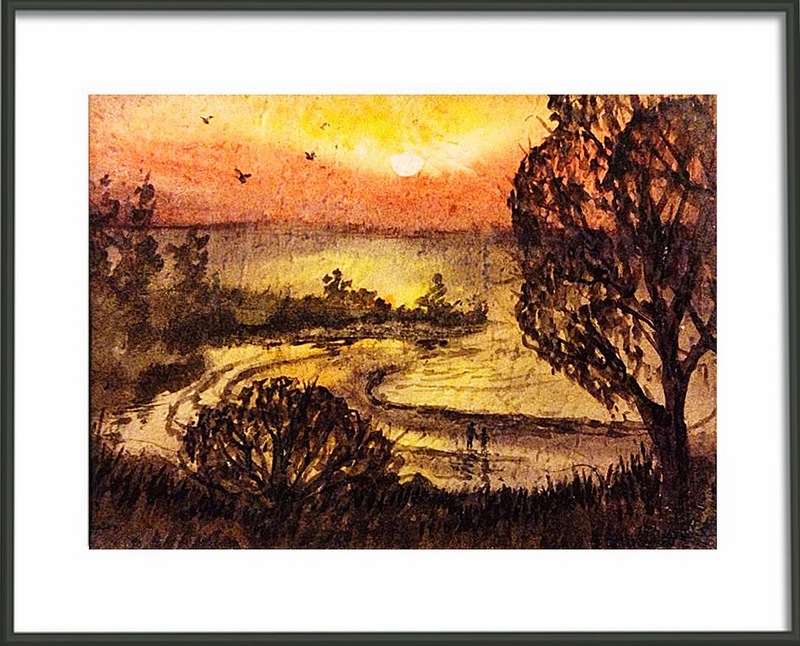 My client was very happy with the results; and, she loved the original painting when it finally arrived in the mail. 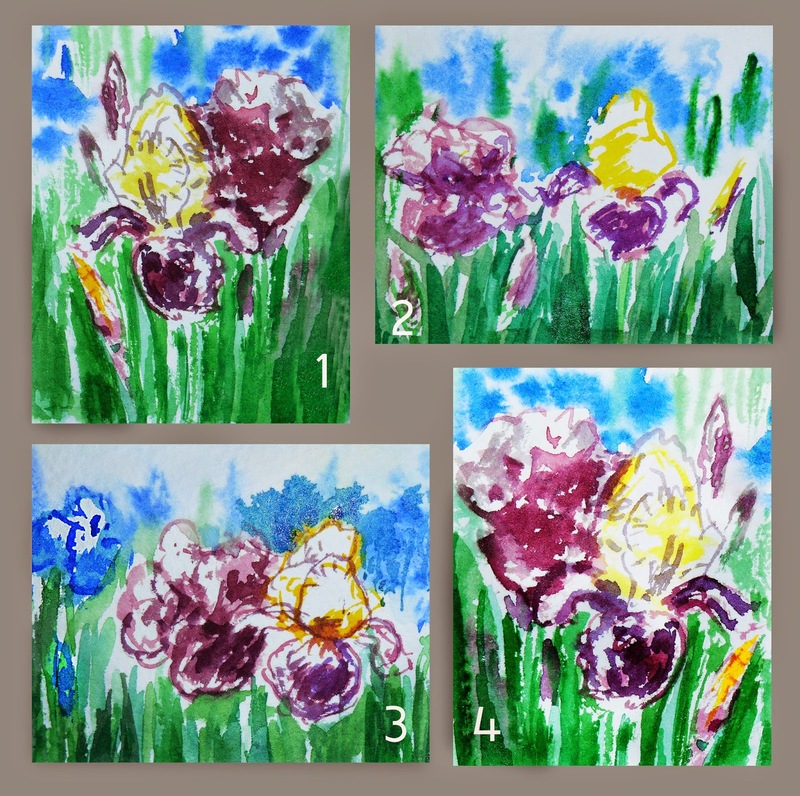 But, as I usually like a little more than just one painting creation, I've also created a few designs with these Iris Flowers for Thank-You Cards, Birthday Cards and just Notecards with these sweet little flowers. 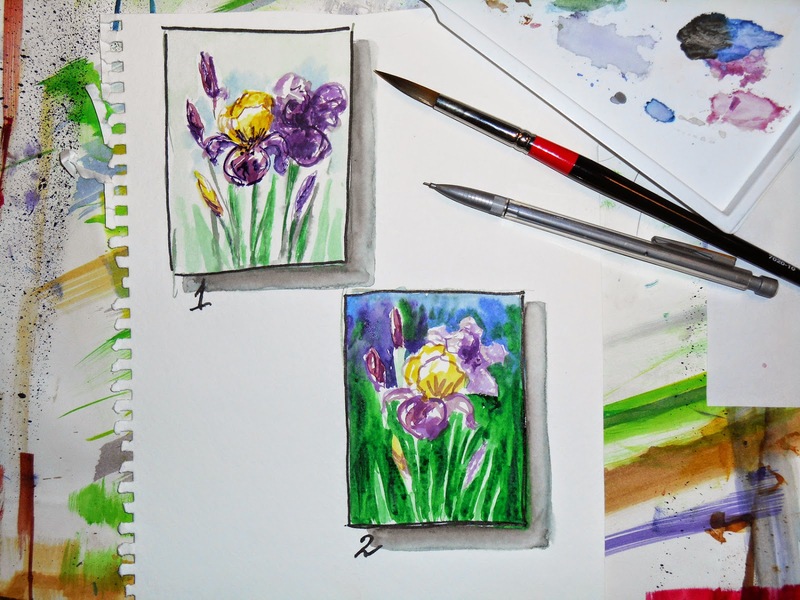 My Cards Gallery is now in full bloom with these and other iris flowers. 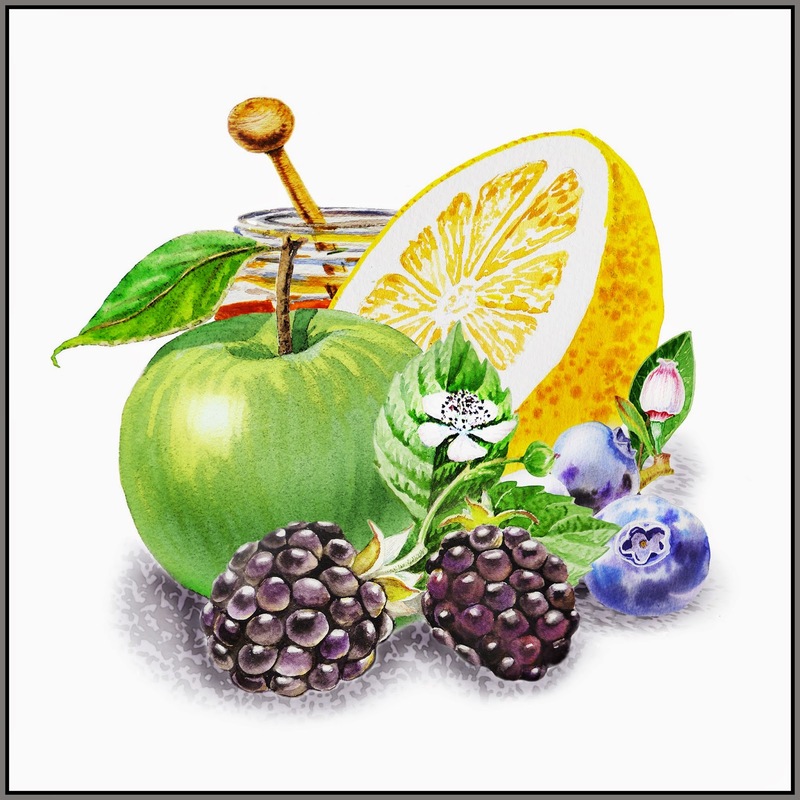 A Very Very Berry designs were inspired by the Forest Fruits jam label order that I posted below. 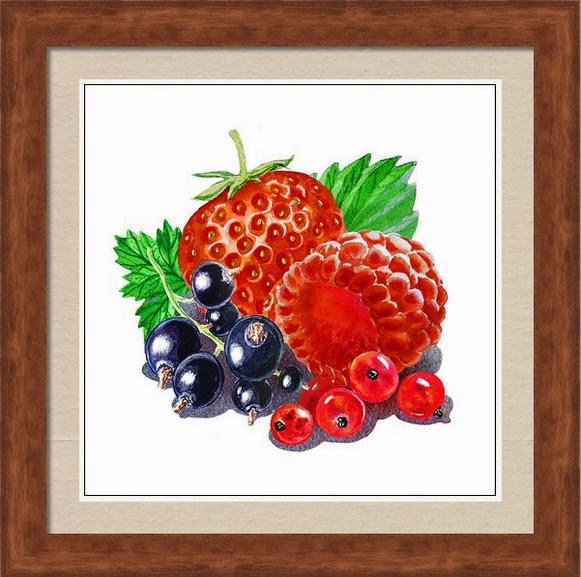 It was an instant desire to bring some of my painted berries together; than more then better, creating one juicy watercolor still life. It was easy to find good "models" for these artworks. Sweet, fresh, and mm tasty!! The Thanksgiving holidays are not even started, and we are already exposed to Christmas holiday themes in the stores, TV commercials and radio. Feels that it is a little earlier than ever. Yet for some venues it is the right timing to think about holidays fast approach. Among them are some artists and publishers. 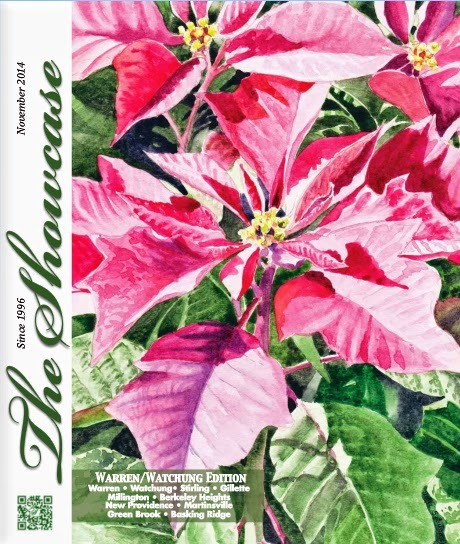 I am glad to announce that one of my Christmas paintings, the Pink Poinsettia, was selected for November cover of The Showcase magazine, which will be circulating mostly in December. 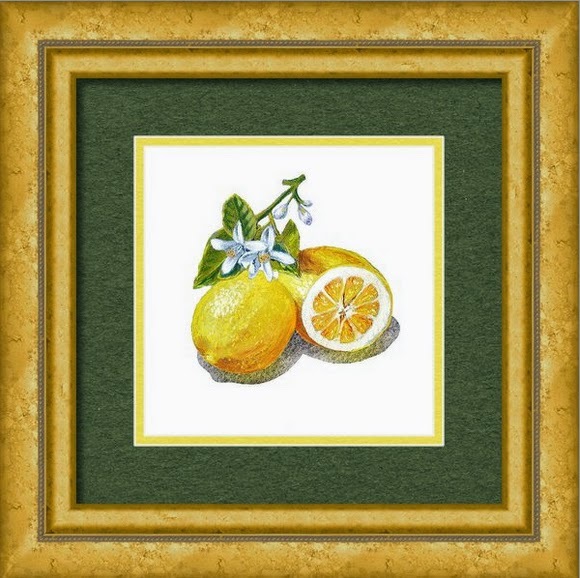 Editors of the magazine chose this artwork appreciating a realistic approach combined with continuous decorative floral pattern so well suited for the holiday’s spirit. 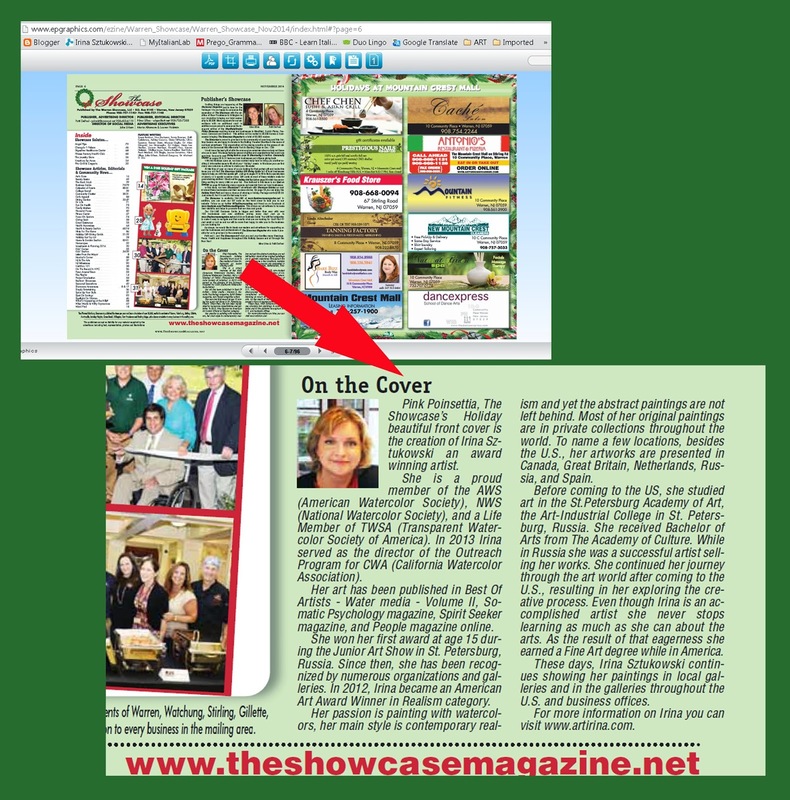 Established in 1996, The Showcase offers the community a professional magazine with informative columns, community news, community calendars, and articles. What Color Are The Vitamins?! 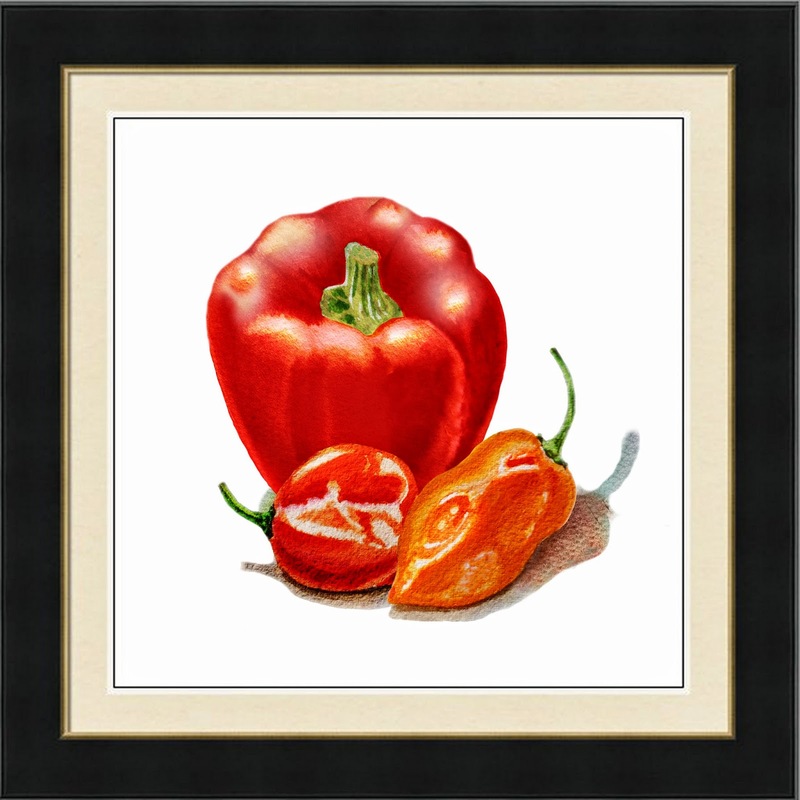 My Jam, Relish, and Marmalade Gallery is growing. 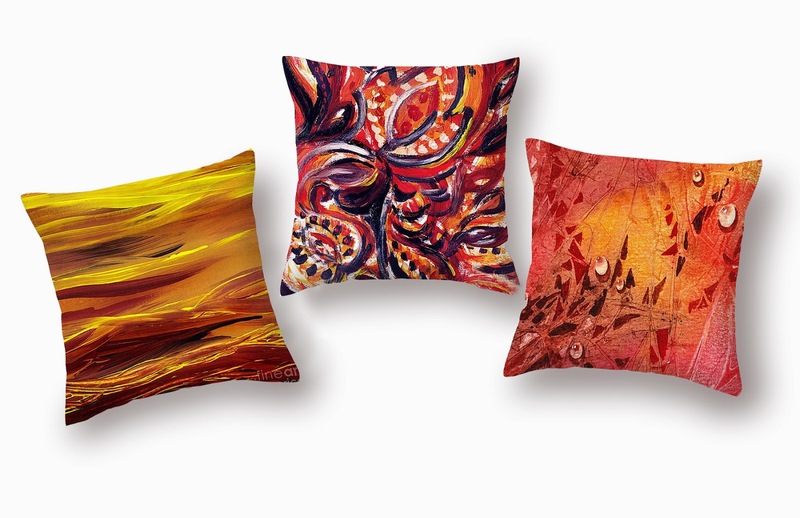 Several new paintings and designs were born in the last month. And with enough water and plenty of colors on my palette, it keeps growing as if I opened a "Farmers Market" in my studio. 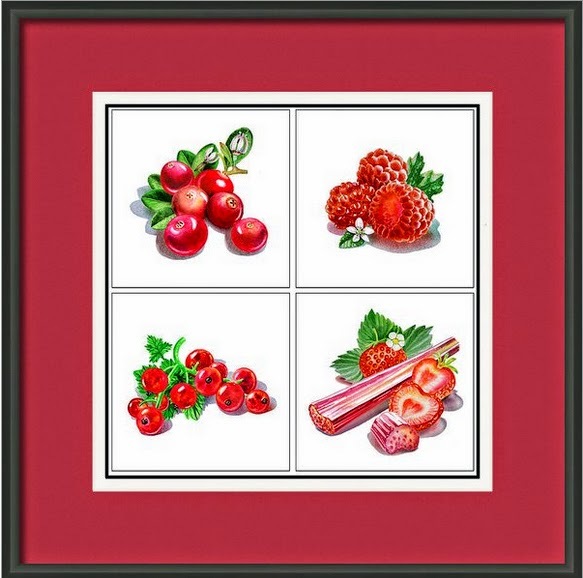 I've looked at my previous and new paintings of vegetables, berries and fruits and combined them into a color themes. The above one calls for some cool colors. 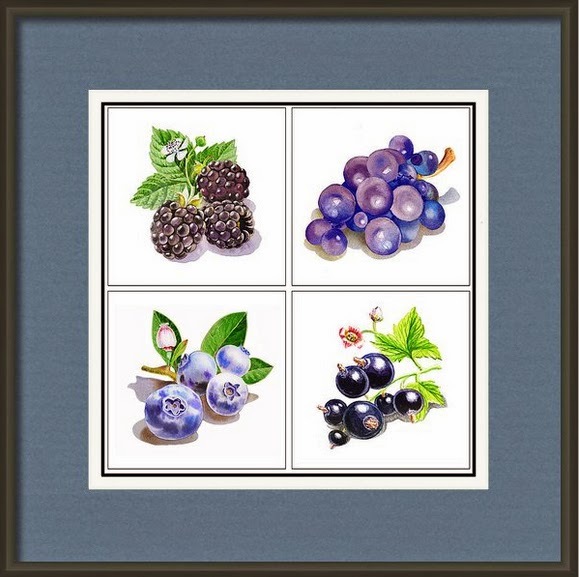 This group is for Blue and Black Vitamins, and it contains blueberry, blackberry, blackcurrant, and grape paintings. 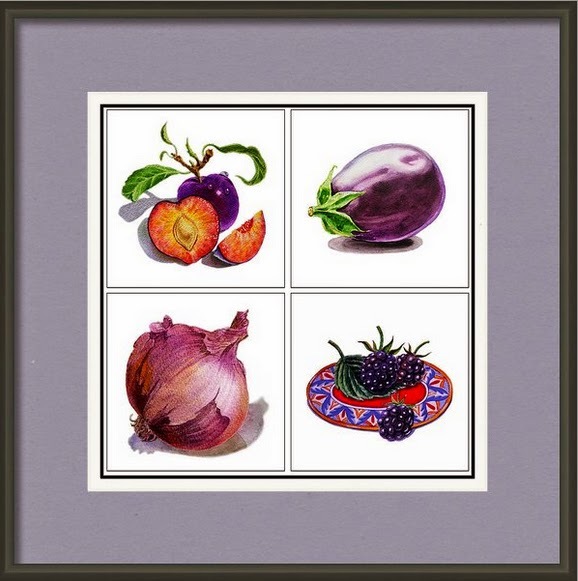 And not so well coming together in one dish, but oh so well came together by color into a collection of Purple fruits, berries, and vegetables. It was fun to combine so many different creation of mine into a colored vitamins series. Thanks to my Jam Labels project, which allowed me to generate so many different designs! 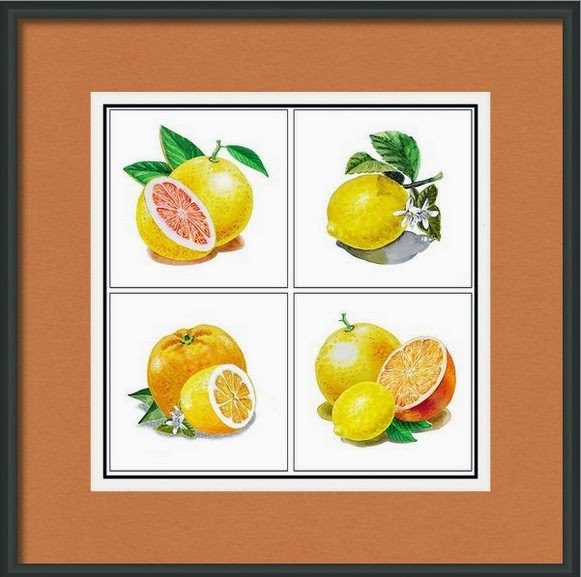 A combination of flavors of Grapefruit, Orange, and Lemon in one marmalade sounded oh so good to me. 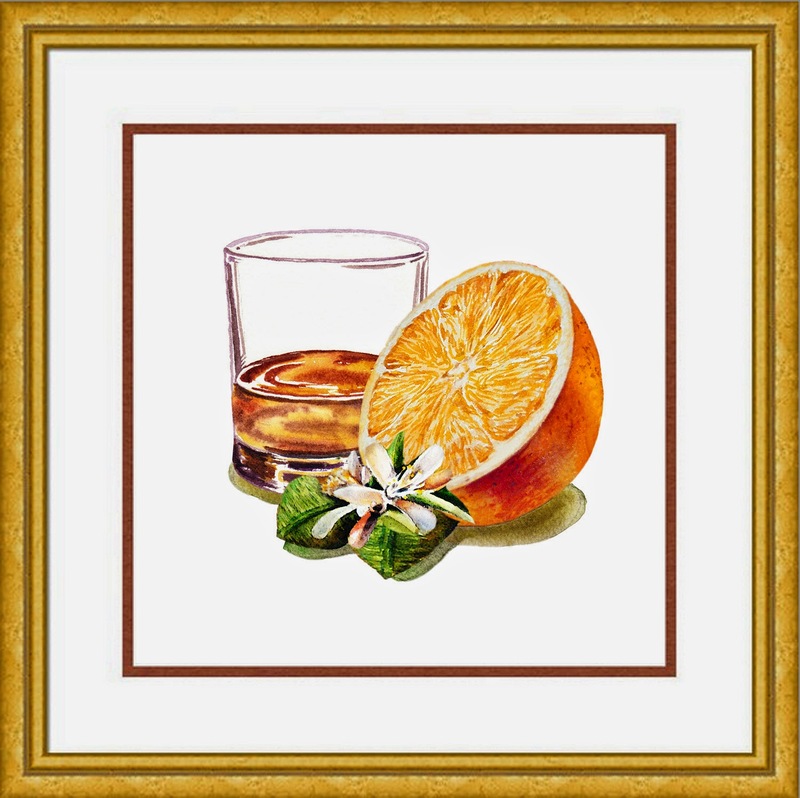 It waters my mouth even now, when I am writing this post. 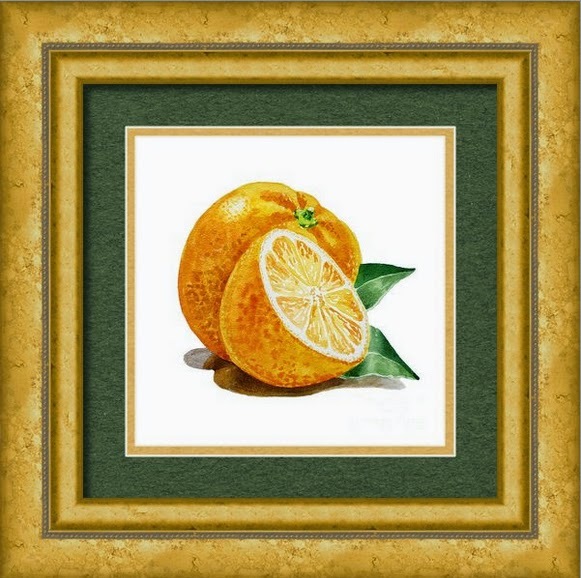 As an artist and illustrator, who created images for jams and marmalade labels, I had to juggle between different shades of yellow and orange there. 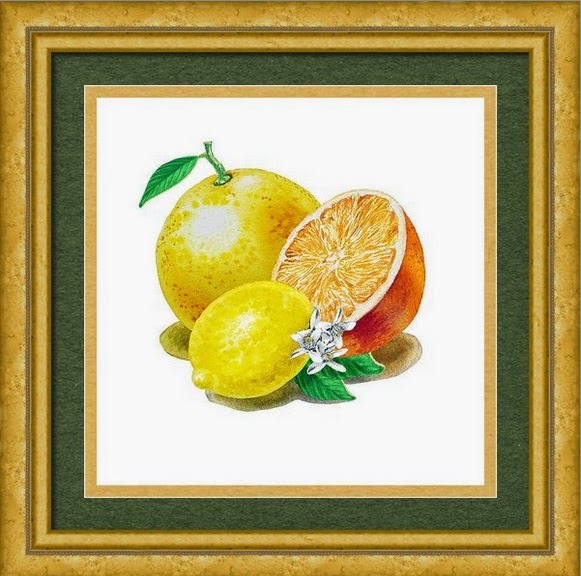 But my all favorite of this Citrus Bunch designs was a request to create a label painting for Whiskey Orange Marmalade. 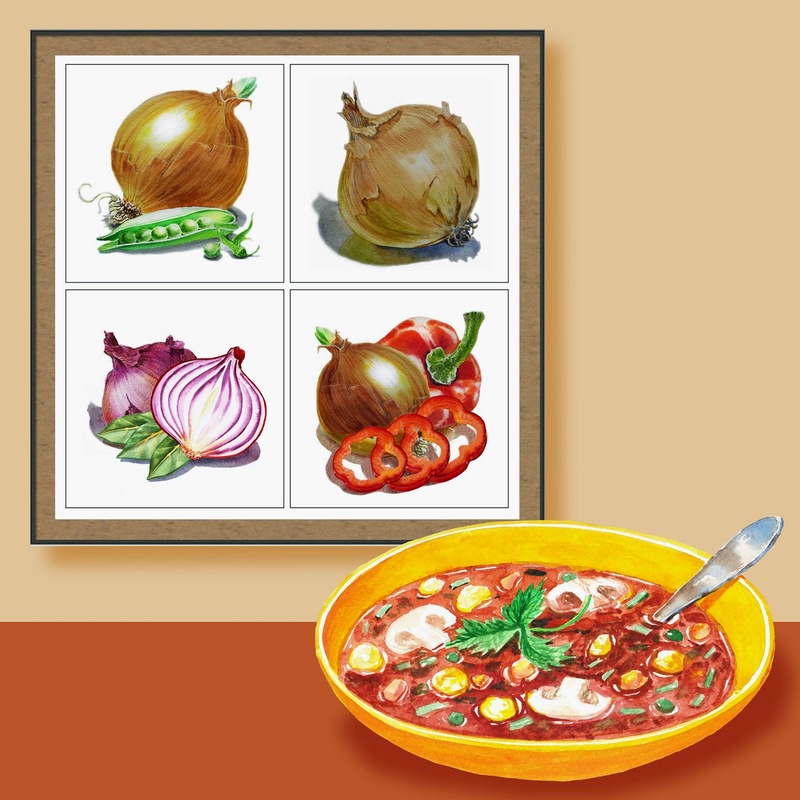 As an artist and illustrator I paint artworks that usually tell a story. 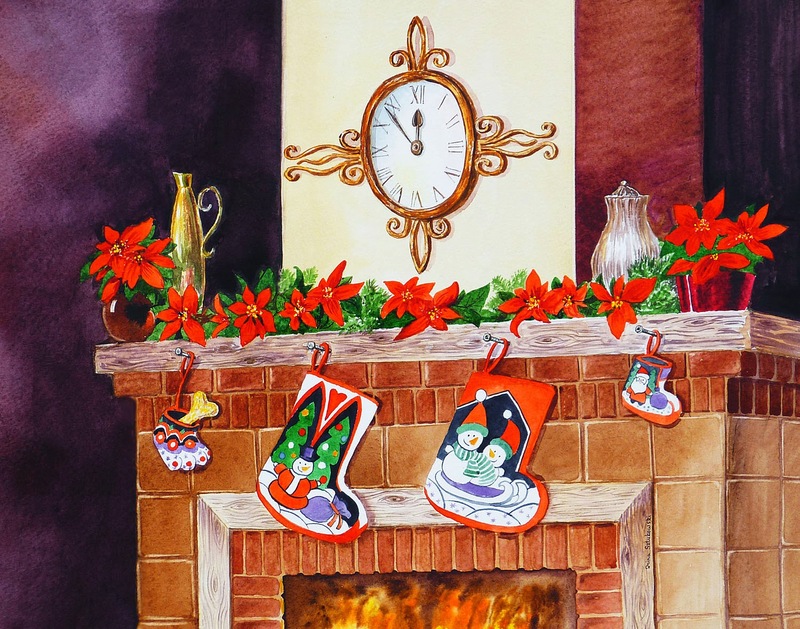 In the month of November I am running a contest for the Best Christmas Story that would apply to the above painting. A dozen of cards from the Artist's collection that includes one hand-painted card. 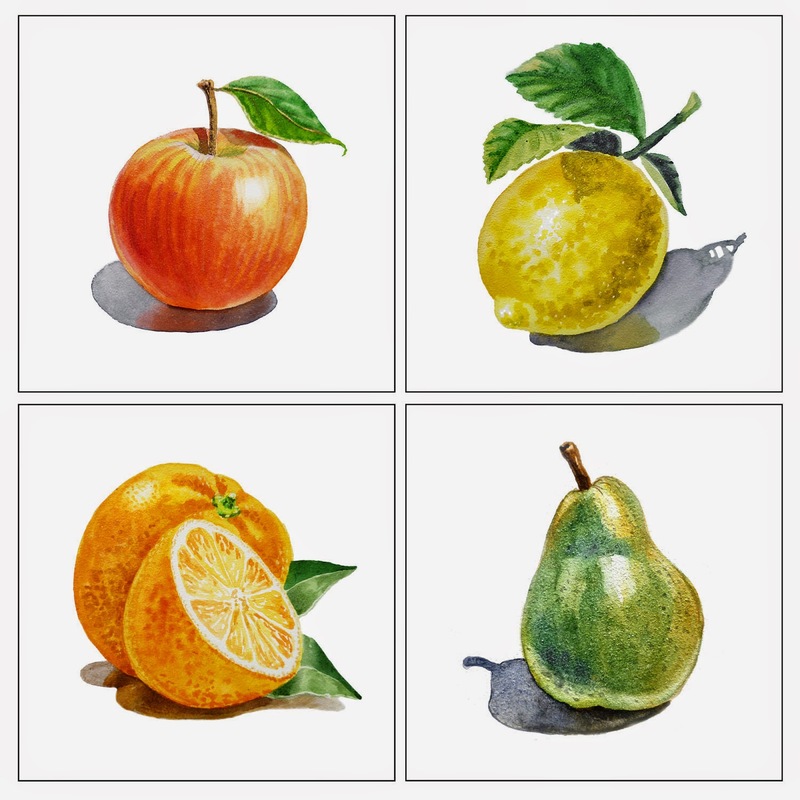 Half of a dozen greeting cards selected by the Artist. Just e-mail me the story. It doesn't have to be too long (a half of printed page or a page will do good). 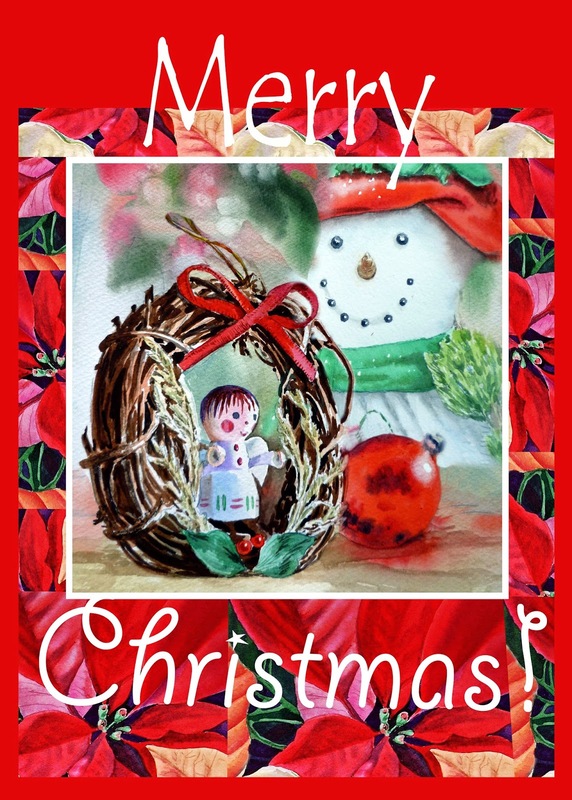 Look at the painting of this Christmas Scene, imagine, create your own Christmas story. Please indicate if you want your name published when I place the story online between the 1st of December 1st and the 10th. 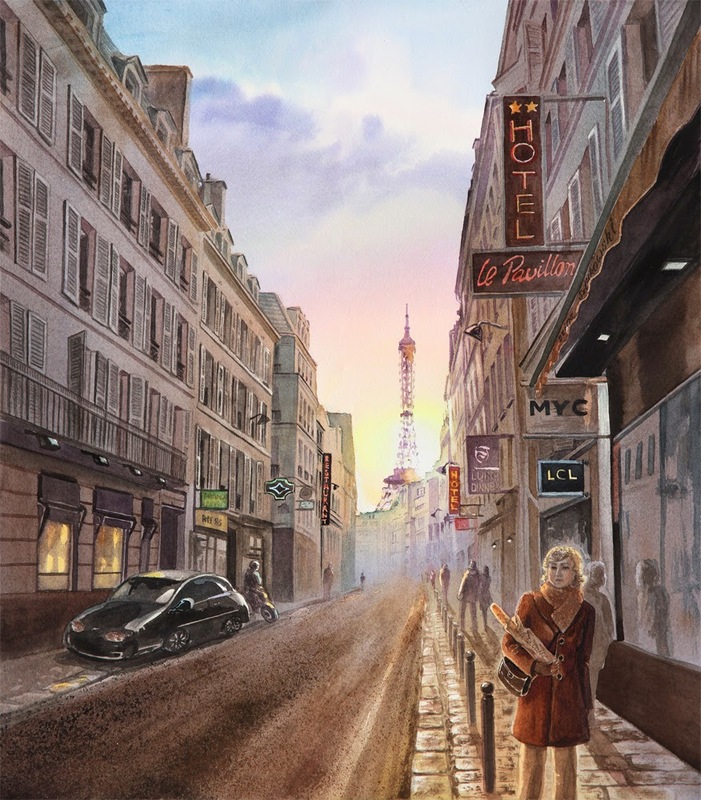 The winner story will be next to the painting on my website; and, who knows maybe some day it will be in a book. 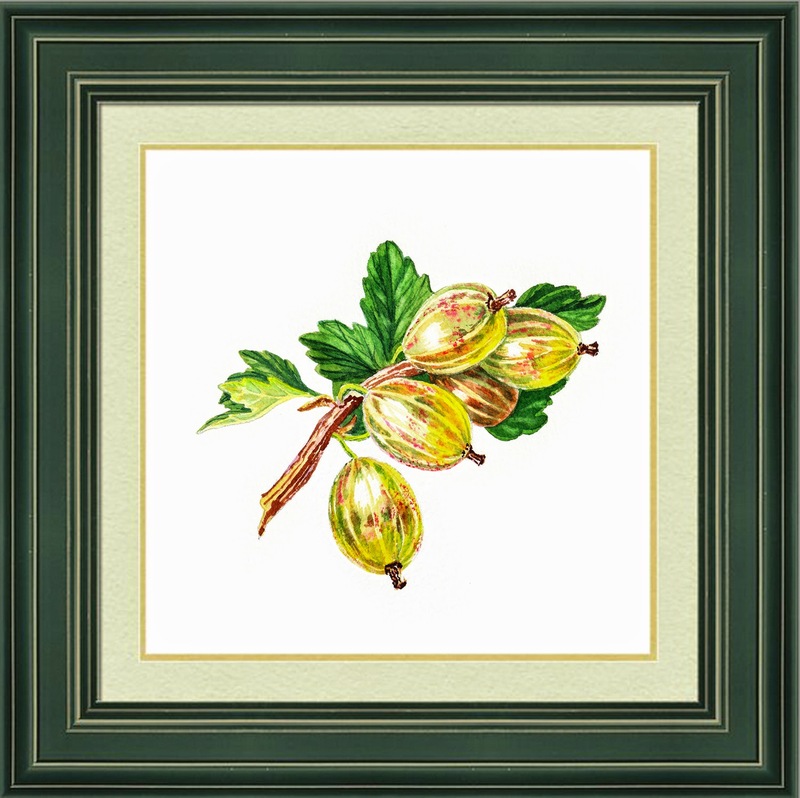 When I was looking at variety of gooseberries for my Jam Labels Project, I got some goosebumps realizing how many different kinds of those berries are in the world. They can be green, they can be red, they can be kind of green but with red spots. 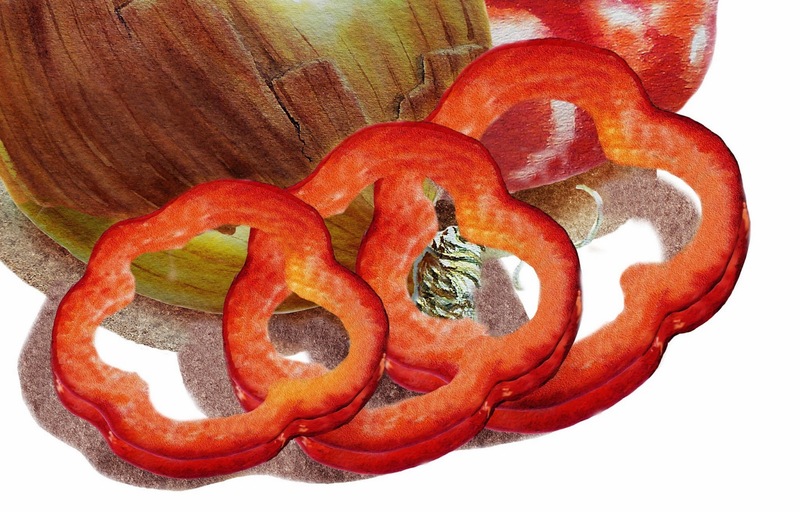 They also have many different sizes: round, oval; and, tastes: sweet, sour, sweet-n-sour. So my decision was to paint them all. 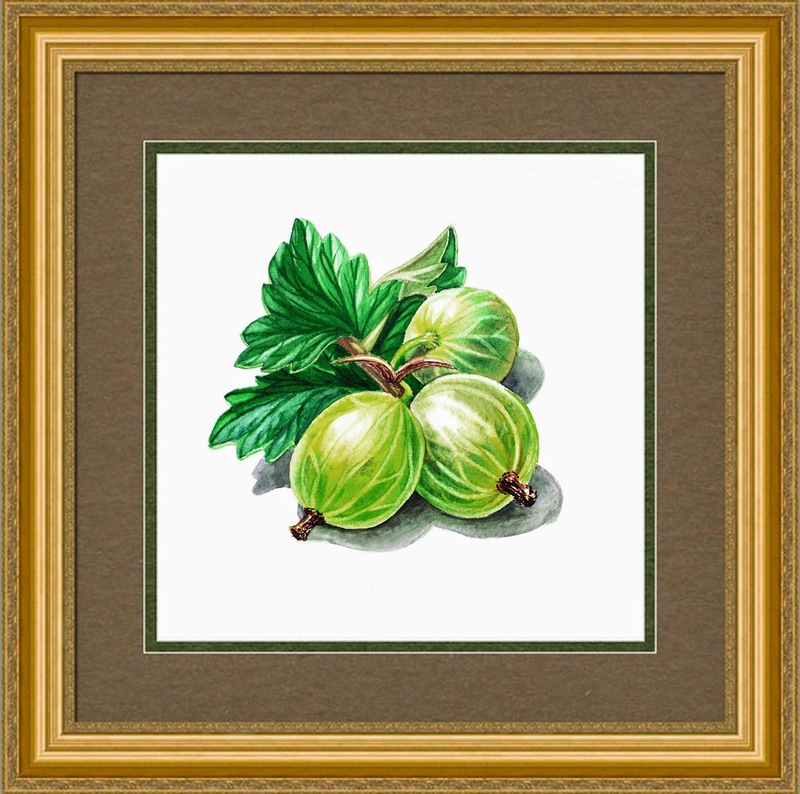 The green and round gooseberries above are composed in a compact still life, more suitable for labels with central composition. 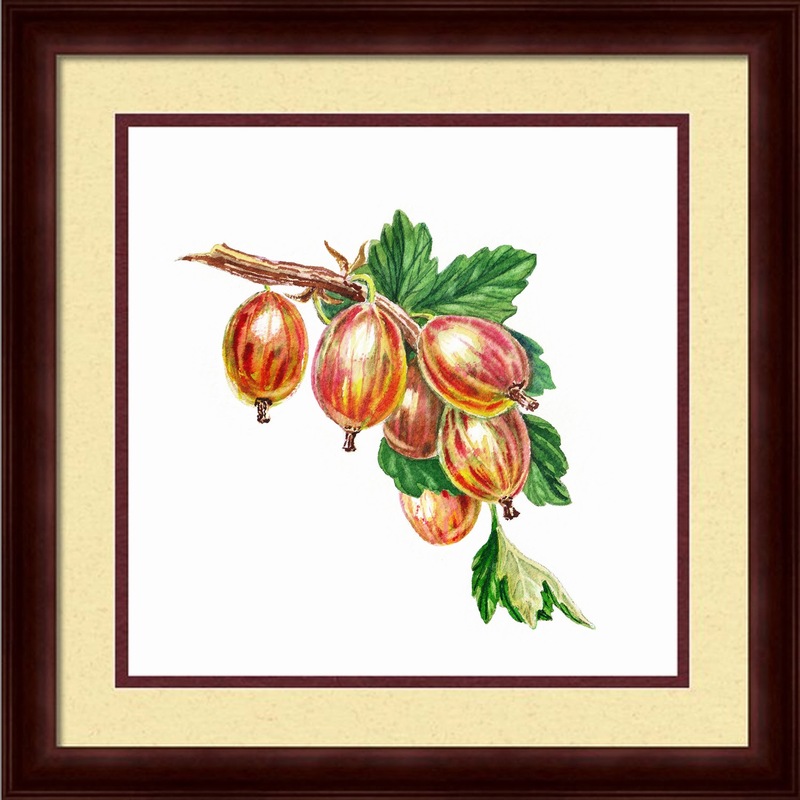 Red gooseberries here, represent more botanical style. Painting blackcurrant and redcurrant was fun. 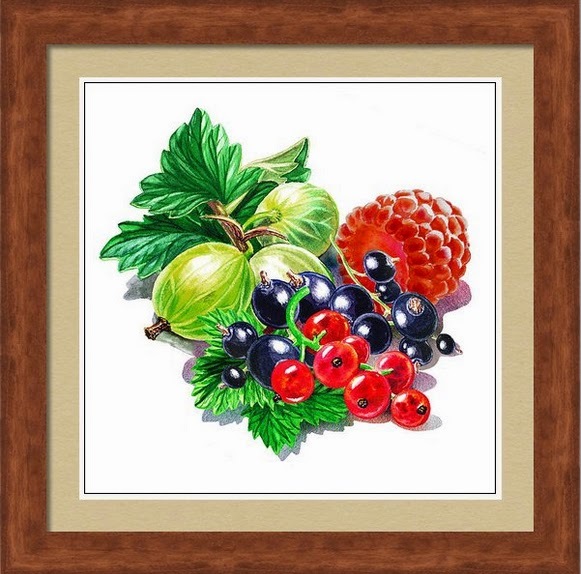 Those closely related berries brought some challenge for me as an artist. 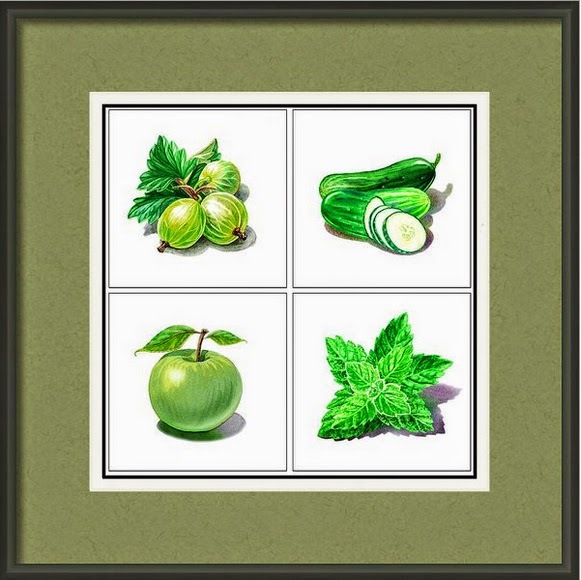 I had to juggle between botanical approach (e.g. 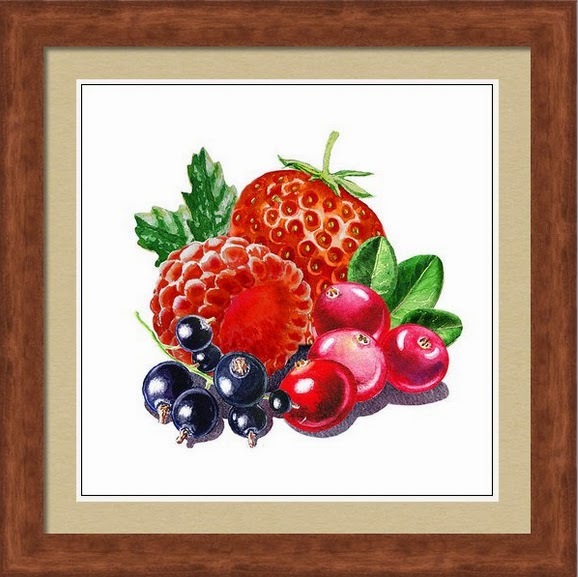 realistic painting) yet still keep in mind that those tiny berries will be even tinier on the jam labels. 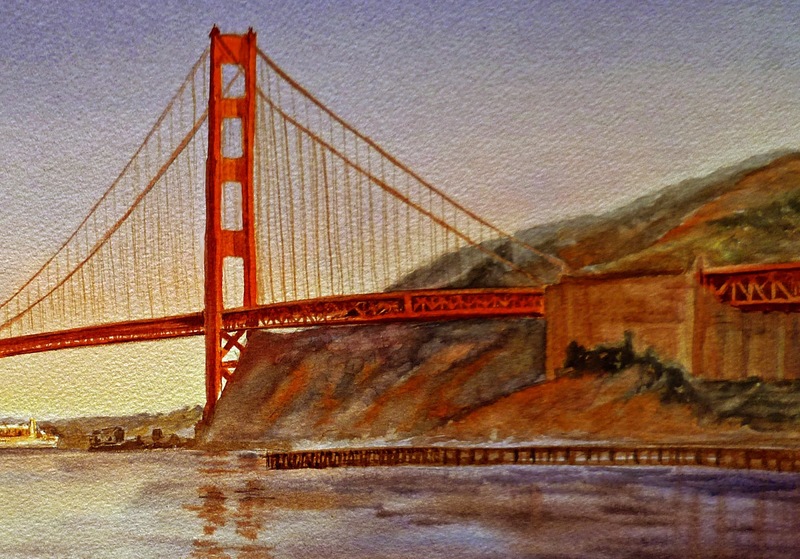 So, in spite of my love to realism in watercolor, I had to simplify a little. 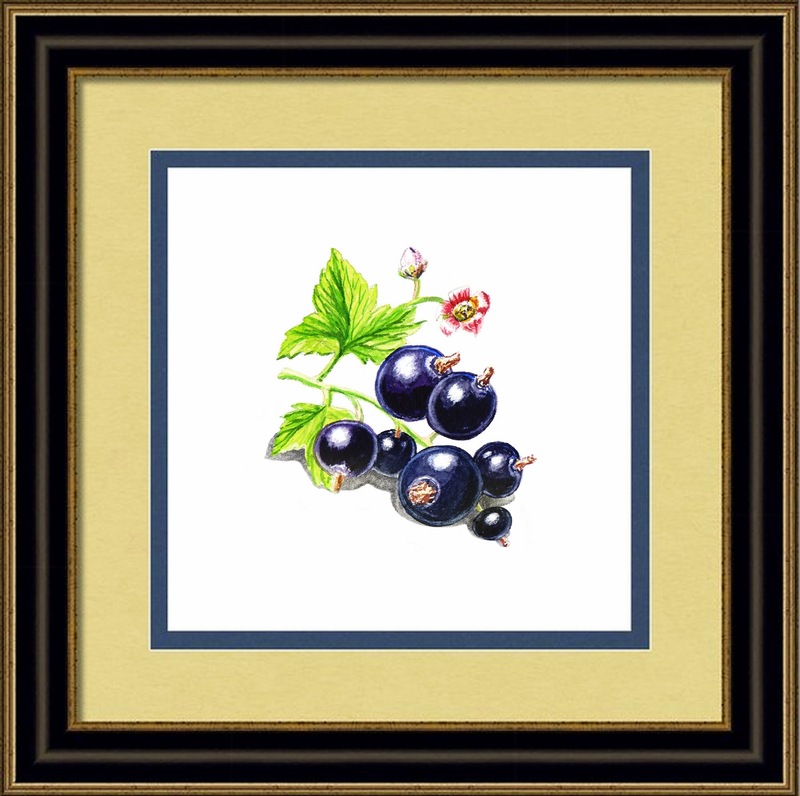 I still wanted some details on the blackcurrant and redcurrant berries, so I painted them doubling the real size on paper. And when I painted, I had to step aside quite a bit in order to see the "whole picture" and not to get lost in the berry maze. 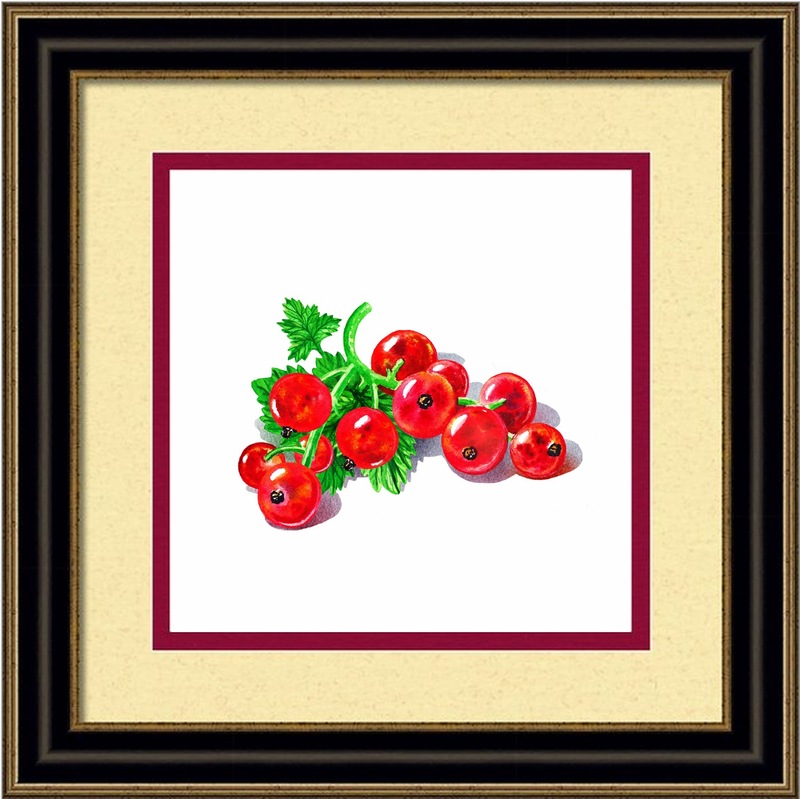 It is interesting to note that when I painted blackcurrant, I had to apply red (Alizarin Crimson) as the first wash, in order for the black to have rather warm tint. The jam labels project continues. 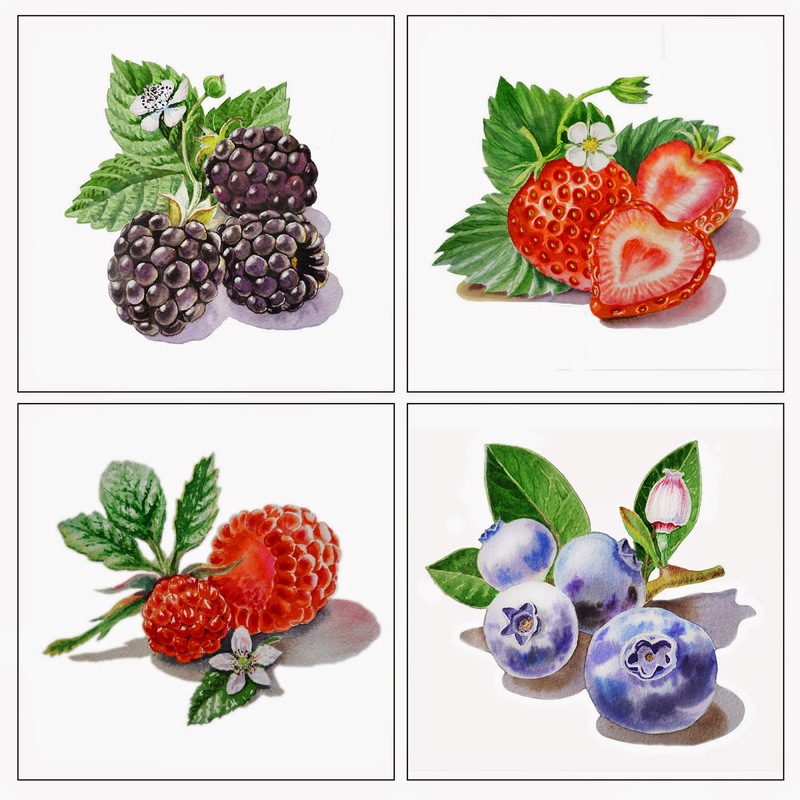 I am not only eating lots of good fruits and berries, but definitely "killing" many birds with one stone: researching botanical structure of the fruits and berries, having good time painting with watercolors, and accomplishing a big important project. About a month ago I've received a request from one jam producing company from Great Britain. 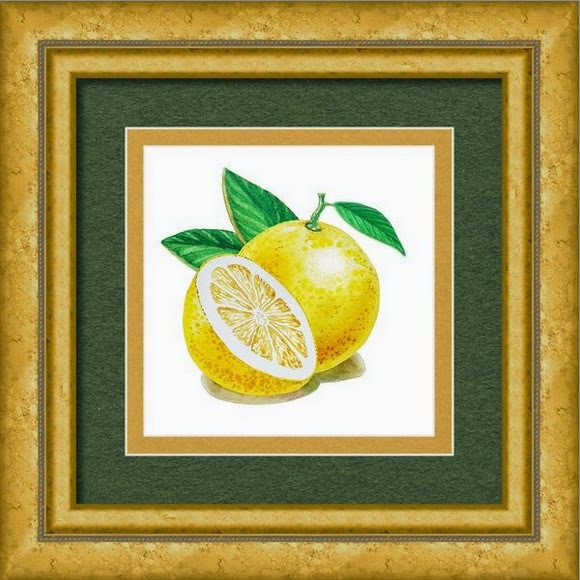 This company thought my style of painting will fit greatly the labels of their jams, relishes, and marmalade. 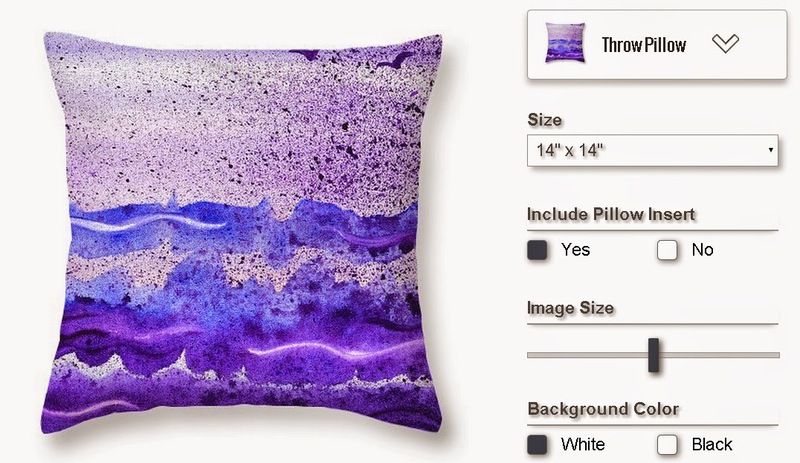 There will be dozens of new designs that I will need to create. I am quite excited about this new Jam Labels opportunity. It will involve my artist skills and polish my illustrator skills as well.